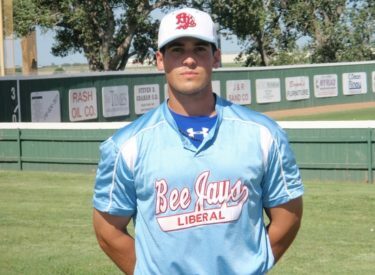 The Liberal Bee Jays came from behind on Tuesday to knock off the Hays Larks 6-5 in Hays. The Larks scored the game’s first runs scoring four in the second inning. The Bee Jays put a four spot of their own though in the sixth inning that included a Joe Perez two run homer. Hays re-took the lead 5-4, but Joe Vaskas hit a two run homer for Liberal in the seventh to give the Bee Jays the lead for good. Travis Parker earned the win in relief lasting 1 and 2/3 innings giving up no runs and striking out three. Nick Youpel pitched a scoreless inning of relief, and Tomas Cruz pitched a scoreless ninth to earn the save. Hays drops to 20-17 overall, and 16-15 in the Jayhawk League. The Bee Jays improve to 31-12 overall, and 22-11 in the league. Liberal will conclude the regular season on Thursday at Dodge City at 7 p.m. The game will air on 1270 AM and right here on kscbnews.net.